Collins is owned by Rupert Murdoch. Old maps are always interesting and collectible – they can nicely document a misapprehension of geography appropriate to that specific time. However, the HarperCollins online update will be harder to frame and hang on the wall. richard pauli – You could get a digital photo frame. Great they’ve corrected this but the claim that scientists are sowing confusion is odd. First we have the BEST project (as you note) that claims everyone else is wrong then confirms their results, now this. It’s a transparent debating tactic to ascribe the flaws in your own argument to the other side, and I would have thought after all this time, it’s wearing a bit thin. Maybe I was distracted at the time, but notable by its absence was any public comment from the Climate Community. Instead it was left to Scientists from the Scot Polar Research Institute to question the claims and the validity of the Greenland map. Perhaps it served the Climate Community purpose in some way to remain silent on the issue. I’m sure it has, but alas I fear the episode will have done little to improve trust in climate science, or rather the Climate Community. However, you do not acknowledge reiterate the direction of the error, which was to report an impossible, way overstated 15% ice loss. You should be skeptical of skeptic denialist claims of conspiracy, and wary of making such claims yourself unless you’ve confirmed things. You know, basic things as to whether or not there’s an official “Climate Community” that is identified as such. RealClimate has previously discussed “the direction of the error” in great detail. First, any “interested reader” who is interested in reading anything on the Internet should follow links, and any writer of anything substantive on the Internet should provide links to relevant supporting material. Indeed, in your capacity as a self-described “big time” guest contributor to the denialist disinformation blog WUWT, I wouldn’t be surprised if you have included links in your own articles, which you would certainly expect “interested readers” to follow. Second, there is nothing whatsoever “misleading” about the title “Greenland Meltdown”, since the RealClimate article in question discussed “the record-breaking 2010 surface melt area in Greenland” and the fact that newly reported data shows that 2011 “was either the 3rd or 6th year in the rankings” of Greenland surface melt. With all due respect, your attempt to suggest that RealClimate is being “misleading” about Greenland ice melt, or is somehow trying to cover up the “direction” of the Times Atlas error which RealClimate in fact helped to publicize and get corrected, is as silly as it is dishonest. “as silly as it is dishonest”–that’d be a good masthead for WUWT, if you ask me. Perhaps I cast my net too wide. I had in mind the CRU, Met Office Hadley Centre, Tyndal Centre, UVA Climatology centre, GISS, etc. etc. As for public comment I would have hoped for a press statement from one or more of these at the same time as, or before, that from the international glaciological research community. Thanks SecularAnimist (Comment #9) for taking the time to follow the link from my name to my personal blog and, from there noticing that I am a Guest Contributor to a “big time” climate blog, which you characterize as “denialist”. When it comes to the Atmospheric “Greenhouse Effect”, some of the commenters on that blog are “disbelievers” (the term I prefer to the non-PC “denialist”). However, the Management and Guest Contributors at WUWT accept the basic truth that CO2, water vapor, and other “greenhouse gases” are responsible for an ~33ºC boost in mean Earth temperature, that CO2 levels are rising, partly due to our use of fossil fuels, that land use has changed Earth’s albedo, and that this human actvity has caused additional warming. Therefore, IMHO, it would be closer to the truth to call WUWT a “skeptic” site that calls into question exactly how much the mean temperature has increased since the advent of the thermometer record in the late 1880’s, how much of that is due to human activities and how much to natural cycles not under our control, what dangers rising temperatures may pose to human life and civilization, and what technologically and politically doable actions may be taken to reduce human-caused warming, and our dependence on foreign sources of fossil energy. For evidence of the above, please have a look at my series on “Visualizing the ‘Greenhouse Effect'” (1, 2, 3, 4, 5) that was well received over there. Why not engage in a rational discussion of the valid scientific, technological, and political issues that separate well-informed and ethically motivated people on both sides of these issues. Comment #7 reminds me of an episode of “Seinfeld” in which Elaine broke up with her boyfriend because he neglected to put an exclamation point at the end of a phone message that he had written down for her. #12–Good to know–but I guess it refers to ‘present company only’, as I certainly recall some bygone posts that appeared quite, uh, “incongruent” with this description. I also note that the description does not affirm that current temperatures are rising. That, to me, would seem pretty well-established, what with the canonical 5 datasets–already replicated at CCC and by a good number of other folks, many of them ‘outsiders’ presumably immune to ‘groupthink’–now being validated again by the BEST project. Perhaps the absence of such was an oversight–or is the validity of the satellite/instrumental record, too, going to be ‘a matter of degree,’ so to speak? And who, exactly, do you think _doesn’t_ question “exactly how much” eh? Oh, wait, that’s a red herring. Nevermind. Such a “rational” discussion would not include false and offensive insinuations that RealClimate did “not acknowledge the direction of the error” in the Times Atlas map and that RealClimate’s article on the melting of Greenland ice was “misleading”. On the other hand, such baseless conspiracy theories are a standard part of the irrational discussions that are the stock in trade of the denialist disinformation site WUWT. I absolutely and unequivocally reject your characterization of WUWT as a “skeptic” site. There is nothing “skeptical” about rejecting the overwhelming scientific evidence of ongoing, dangerous anthropogenic global warming while perpetrating and promoting falsehoods, distortions, sophistry and conspiracy theories, which is what WUWT is all about. The proper term for WUWT is “denier” or “denialist”. And for the record, the implicit allusion to Holocaust denial is entirely intentional on my part. Ira Glickstein, By all means civil discussion is to be preferred, but I would suggest that automatically assuming bad faith of your hosts here at RC, when they had in fact previously discussed exactly what you were complaining about is not the best way to start a civil discussion. I am also all for predicating such a discussion on accepted science. The existence of the greenhouse is certainly a bare minimum–as not just its existence but also its magnitude have been known for over 100 years. Kevin has pointed out abovethat we have several independent datasets that all show consistent warming trends. I would think that, too, ought to be hard to deny. I would also add the determination of CO2 sensitivity via several independent lines of evidence–all of which, amazingly, favor a value around 3 degrees per doubling. I find it somewhat difficult to understand how one can contend that somehow the greenhouse effect ends when CO2 concentration reaches 280 ppmv. Of course, it’s the international glaciological research community that has the most relevant expertise. But I guess that doesn’t matter, eh? Brian Blagden. I suggest that you scrutinize every article on convective transport, radiative transfer, infrared spectroscopy, and cloud formation written in the last forty years. I expect you may, if you’re diligent enough, find errors. If such an error is not denounced by glaciologists from the Scott Polar Institute, that will prove your theory. I personally don’t believe that Shakespeare wrote Shakespeare’s plays: they were written by someone else with the same name. Must rush-time to take my meds! 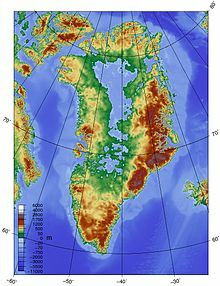 Is there a map of Greenland with all or most of the ice melted, and the sealevel risen under a extreme warming scenario, say, some 1000 or 2000 years from now if extreme warming takes hold. Or could someone do such a map. I read somewhere that Greenland would look more like an atoll of islands, or a ring with a huge lake in the middle. But what do I know. I can’t even remember where I read that. Thanks Moderator Eric for your Response re SecularAnimist (#16). As for sensitivity for CO2 doubling, the IPCC gives a range of 2ºC to 4.5ºC, so your 3ºC is about their average, and that range depends upon net cloud feedback being positive. Other competent scientists have argued for a lower sensitivity, perhaps 1ºC or even less, based on clouds being net neutral or even a net negative feedback. We all agree that CO2 levels have gone up rapidly and nearly linearly in the several decades since Mauna Loa data came available. Yet, despite the steady rise in CO2 over the past decade, there has been no statistically significant mean warming. That is an argument for a bit of cooling due to natural cycles overcoming most of the warming effects of rapidly rising CO2. That is evidence for lower CO2 sensitivity estimates. I know of no one who claims the effect of CO2 ends at 280 or 390 ppmv. However, everyone agrees the effect is logarithmic, which is why CO2 sensitivity is based on doubling. All else being equal, going from 200 to 400 will cause about the same amount of warming as 300 to 600, 400 to 800, etc. So, the effect of each additional 100 ppmv will be less and less, but will never end entirely. And, of course, all else is never equal. The Ice Core data report natural (pre-human) cycles of temperature and CO2 that go way above and below anything experienced in human history prior to or during the industrial age. The timing of news releases may be as simple and innocent as the details of how people within the organization communicate, who has the authority to respond, who needs to agree to the statement and who is on leave at the time, nothing sinister at all. You’ve confused CO2 with climate. Moderators, I nominate this person’s regurgitation of long-since and many-times-over debunked talking points for consignment to the Bore Hole. will give you some idea of the current state of affairs. As Eric points out in his comment, once the ice cap starts melting a race begins between rising sea level and the rebounding crust. To get a feel of how much rebound might occur these two maps of Canada give you an idea. Were all of Greenland to melt you could expect a 6.5-7 meter sea level rise. To suggest this is indeed ‘plain silly’… Luckily that is not what I was suggesting. Given that despite previous discussion/papers/guidance and / or Press releases by one or more of CRU, Met Office Hadley Centre, Tyndal Centre, UVA Climatology centre, GISS, etc. etc. about the likely effects of Climate Change on the Greenland Ice sheet, and the impact of ice melt on sea level rise, not one of those bodies would appear to have questioned why the sea level rise, that should have resulted from the claimed 15% ice loss, had not materialised. Clearly the 15% ice loss figure sounded alarm bells at the Scott Polar Research Institute and this precipitated their action and resulting amendment to the Atlas. The lack of a recorded 1.3m rise in Sea Level since 1999 should similarly have raised concerns among climate scientists that the claims being made by the publishers of the Times Atlas were clearly erroneous. All I am suggesting therefore is that perhaps climate scientists (who were as well placed as the glaciologists to spot the error) should have tried to correct any misconceptions in a similar manner to their glaciological research colleagues. Do you honestly think that scientists have nothing better to do with their time than proofread the freakin’ Times Atlas? Dude, you really need to get out more. Thanks for the link, I read it through. There seems to be an equal statistical chance (at the 2 sigma level) that the past decade may have seen a +0.36ºC rise or a -0.23ºC drop in mean temperature. So the actual change is 0.03ºC +/- 0.26ºC. In other words, slightly more likely there was a bit of warming, but possible the warming was greater or that there was actually cooling. I did not claim warming had stopped, but only that the rise (or drop) is not statistically significant over the past decade. Where I come from (a multi-decade career as a System Engineer for IBM and Lockheed-Martin and a PhD in System Science) “statistically significant” means a chance of error of 5% or less. In other words, it is statistically significant if there is less than a 1 in 20 chance of being wrong. Using that accepted scientific (and engineering) definition of “statistically significant”, the original statement stands. Indeed, Phil Jones [edit — cut out the offensive stuff, please] said as much in this well-publicized BBC interview. An engineer might believe a decade enough, for that data set? Er..no. I also doubt the Scott Polar Research Institute proof read the “freakin’Times Atlas” either. Believe it or not there was a Press release by HarperCollins on the 15 September (or there abouts)that was picked up by many a News outlet. Believe it or not there was a Press release by HarperCollins on the 15 September (or there abouts)that was picked up by many a News outlet. Ah, scientists at those establishments are supposed to sit around and response to PRs then. And of course every scientist sits on the edge of his or her chair just waiting for a press release from a publisher, right? Dude, why don’t we just let the scientists do science? Ira Glickstein, Might I suggest, respectfully, that we take this over to the open thread (labeled “Unforced Variations”). It would not distract from the subject there. Thanks, John. I think it would be worth it to warm the planet enough just so we can have as cool an island as Greenland sans ice. Viva BAU! Methinks you are confusing volume loss with area loss. 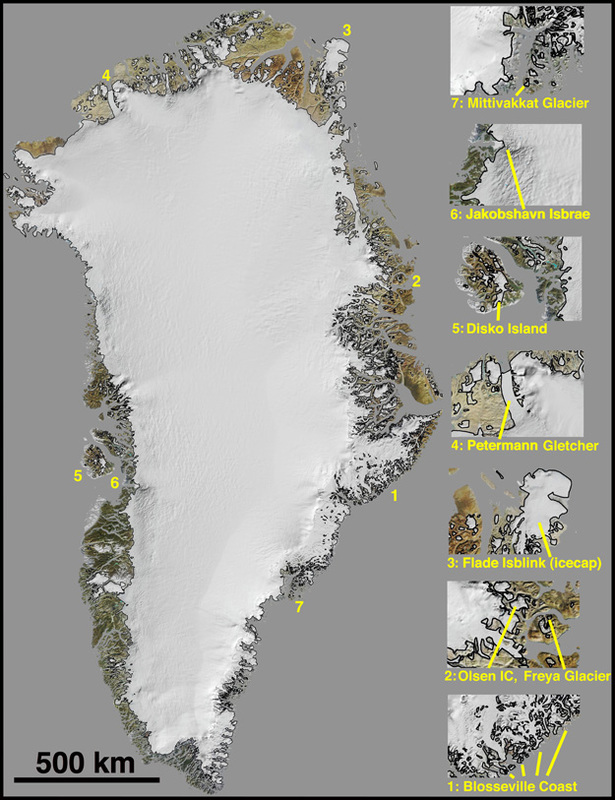 The map error was about areas at the perimeter of the Greenland ice sheet. Those MET office links you posted are specifically discussing total volume loss, over the entire Greenland ice sheet. So unless the perimeter of the Greenland ice sheet is the exact same thickness as the entire ice sheet (say 3 km on average), an area loss there, of 15%, will produce a much smaller % volume loss, than say if this area loss were smack dab in the middle of the Greenland ice sheet. Please remember that the major mapping error was between the 0.5 km contour and the 0 km bounding contour. And also it has to then restart at some higher value, presumably, to explain why Venus is so warm. THANKS, now I know “what time it is” when it comes to T2x(270) as compared to T2x(390), at least to an engineering approximation.